Okay, maybe that's a slight overstatement, but downloading and now streaming of music has only contributed to, rather than mitigated, the effects of the digital consumer world on the environment. Most people think that going paperless and sticking with electronics means "going green", and most people are wrong. E-waste has exploded exponentially in recent years and the energy required to power all the servers and clients connected to the Internet is stupendously enormous. "Going digital" means exchanging an often one-time environmental cost (the production or duplication of a song) for a continuous burden on the environment that never ceases. 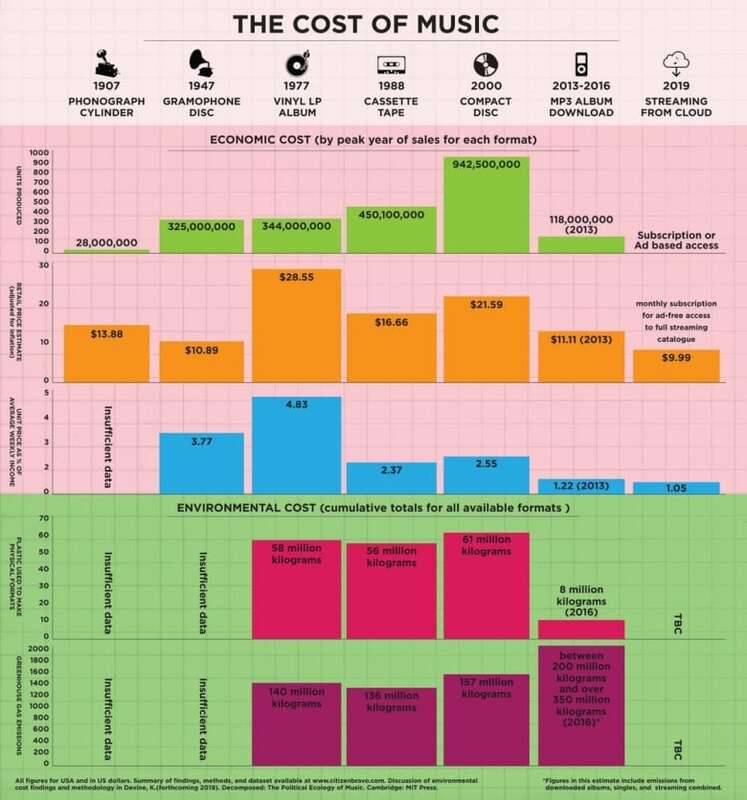 As you can see in the chart above, although the amount of plastic used in the "production" of music has dropped significantly with newer listening methods, actual greenhouse emissions are higher than ever — today, they're a whopping 50 million kilograms more than in 2000, the peak year of CD popularity. So, the analog audiophiles have had it right all along. Considering that Earth Day was yesterday, why not honor it by cancelling your streaming accounts and "going analog" this year? That's right — close your streaming accounts, ditch your MP3 player, and maybe even bypass that stack of CDs. Pop a casette into your tape deck or a vinyl record onto the turntable, and Happy Earth Day! Education in the United States right now is quickly becoming a joke. Some would say it already has been, considering that the U.S. lags far behind in math, science, and other benchmark scores compared to other developed (and even less developed) countries. Yet, the controversial Common Core standards have ushered in a new era of unprecedented dumbfounding educational "standards" that are doing little but ensuring that future generations of kids will be dumber than the ones that came before. If this seems jarring, consider the evidence at hand. Perhaps the biggest dumber of Common Core has been the emphasis on "21st century learning", a movement that is not, as it turns out, academically rooted, but strongly pushed by tech giants like Microsoft, Google, and Apple. After all, they're the ones that benefit when schools buy into "1:1 device programs", not the students using them. Test scores everywhere are declining following the institution of 1-to-1 technology rollouts, and it's not secret why. Although we don't cater at all specially to high school students (or youth in general), we wanted to take the time to review a few key opportunites of which you can take advantage during your high school years in order to maximize your present and future success. First is Academic Decathlon. A rigorous, intellectual, but fun series of competitions, Academic Decathlon is "the premier academic competition in America". With essentially limitless room for improvement, the competitive nature of the activity can really bring out the best in students, forcing them to tap into potential they may not even have known they had. Though the competition is largely objective, all competitors will also need to present a prepared speech — as well as an impromptu speech — and participate in a mock interview. An essay is also written in advance of each higher level of competition. With students with both high and low GPAs needed, AcaDec can be the perfect outlet for smart individuals who otherwise don't exert a lot of effort in school (which is subsequently reflected on your report card). AcaDec is an inclusive and engaging activity that runs from May until April, essentially with a year-round season. With Nationals in 2020 being held in Anchorage, Alaska, don't miss out on the exotic chance to see a polar bear in action! Visit the official USAD website to learn more about how you can get involved in one of the most memorable high school activities there is! Have you ever thought of running your own telephone company? If you're like most people, the answer is probably "no", without any question. But the idea used to be more romantic and enticing. Even during the era of Bell System dominance, from the late 1920s right through Divestiture in 1984, hundreds of independent phone companies existed and flourished — and many still do. Perhaps you remember the New City Telephone Company from the 1975 AT&T video production, "Run A Phone Company", in which high school students participated in a simulation of managing a phone company. While it was purely an educational initiative, it does prompt the question: why can't I run my own phone company? It is with great pleasure that we announce that calls to our new D.I.D. (direct inward dial) exchanges are now working. Just hours after a trunk test number in the 631 area code began delivering calls to NPSTN intercept, calls to all ~975 of our phone numbers began completing. This brings us to the exciting part — InterLinked has new business phone numbers to better serve you! If you've visited the Contact page recently, you may have noticed we've added some new information. You can now reach us directly at our main business number, 564-4040, located in the 407 area code. In the future, me may also acquire a 406 number. If our lines are busy, please be patient and make sure you are calling during regular business hours. Although we have several D.I.D. numbers that terminate into the InterLinked PBX, we have still to acquire the human labor to process those calls! If all of our operators are busy, you may select option 9 from our IVR at 564-4040, or leave us a message on our office answering machine at 564-4047. In the future, we hope to have a fax machine and a modem bank available to callers as well. First, there were "ZEnith" exchanges, the original toll-free numbers. Since there was no Z on the dial, you would call the operator and she would connect you to a business on its dime, making the connection by looking up the number associated with a ZEnith number. Whom should autonomous vehicles kill in a collision? Autonomous vehicles are seemingly all the rage in many of today's tech lines. Tech companies like Tesla and Google just won't give up, will they? Personally, this is not so much surprising as it is reassuring. 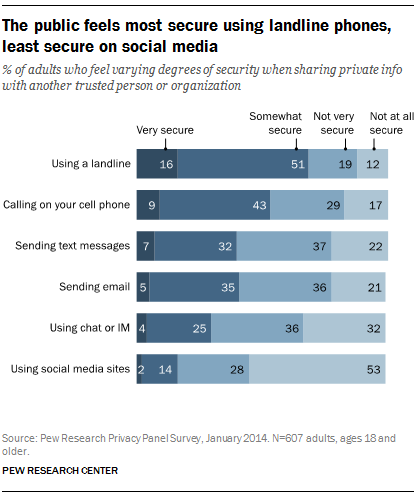 Most people know that landlines are the more secure, reliable communications options. In practice, many of them fail to recognize this when they cut the cord. It's only when danger strikes that they begin to regret this. With the skyrocketing number of wildfires on the move today, this is an eminently practical concern of huge importance to many. In the recent wave of wildfires in California, mobile phones "went silent" as cell towers went down. Search and Rescue actually had to resort to stone age tactics: going house to house on foot! Think twice, or thrice, before cutting the cord. Ask yourself: is your life, and your family's, worth more than $20 per month? The digital divide has taken on a new meaning. Previously, it referred to the areas of the country that relies beyond the reach of high-speed broadband Internet. We referred to them as being unfortunate enough to be "on the wrong side" of the digital divide. All of America still does not have high-speed broadband Internet, one reason why millions of Americans continue to use dial-up Internet today. But now the digital divide has taken on a new meaning, as technology becomes so heavily integrated into schools that the whole idea of the digital divide has gotten flipped on its head. Back in October, the New York Times ran an article titled "The Digital Gap Between Rich and Poor Kids Is Not What We Expected". The caption reads "America’s public schools are still promoting devices with screens — even offering digital-only preschools. The rich are banning screens from class altogether." Yes, you read that right! The rich are banning screens altogether! Should this really come as much surprise, though? Tech moguls like Bill Gates and Steve Jobs have, after all, limited their own children's technology use. Many teachers to whom I've posed the question have confirmed this firsthand: standardized test scores have dropped significantly since 1:1 technology was introduced in schools. It's not just academic or even psychological though: there are now plenty of physiological effects caused by young people's hyper-use of technology. Certainly, technology skills, particularly use of a computer, will continue to be important in our electronic world. But the hype surrounding "21st century learning" is simply fabricated by big tech companies like Apple and Google to sell tablets and Chromebooks (a.k.a useless not-a-PC laptops) to schools, to boost their bottom line by whatever means they can. No doubt one way or another, you've been caught up in the drama of the election that ultimately culminates today, when people will cast their ballots. Today, it seems like every candidate is out to get you, one way or another, and there's no good choice to be made. In the 2016 election, people were forced to choose between the lesser of two evils in a highly polarized election: the only question, who was the lesser of the two evils? (Answer: Neither, vote for a third-party candidate.) Wouldn't it be nice if we could return to a bipartisan era when people could feel good about going to the polls? Fiber-optic cables aren't exactly new. Part of the reason for the 2001 recession was a tech crash caused by excessive buildout of fiber, most of which remained "dark" for years. Fiber has been used for Internet backbones as well as long-distance trunks in the PSTN, but only recently has the idea of extending fiber directly to the home become pervasive. I won't give an overview of fiber here, so for some history and details about how fiber-optic communications works, you can check out Broadband Now. How many digits constitute a telephone number? The most common answers, at least in the United States, which is part of the North American Numbering Plan (NANP), are 7 and 10. There's a pretty good chance that whatever answer YOU gave says something about your age. Adopt A Highway began as a local effort in Texas in the 1980s. Today, the program has spread all over the United States. It's hard to drive almost anywhere these days without seeing the iconic "Adopt A Highway" signs on the edge of the road. That's all great, and the idea could prove to have other useful applications as well. The Year The Music Died — What Happened in 1986? It's a common belief that speed limits are designed to keep us safe. Few of us like to heed them, but we believe they exist for the common good and grudgingly abide by them. A closer look at the facts, however, will put this misconception to rest. Global warming, or climate change as is the more "proper" term, is a serious conundrum. Everyone likes a cleaner planet, but few people are actually willing to adopt a lifestyle that is seriously environmentally friendly. Monopoly isn't necessarily bad. In fact, sometimes it can be a good thing. A very good thing! Most economics classes foster a passionate dislike of monopolies in students. But this dislike is not necessarily deserved. Economics classes teach us about seemingly malevolent monopolies that wreacked havoc on the economy. But most economics courses omit discussion of the largest monopoly ever to have existed — perhaps the most benevolent monopoly of all: the Bell System. Scientific American released an article about a month ago that reported students are supposedly better off without technology in the classroom. Wait, what? Isn't technology the whole point of "21st Century Learning"? Yes, and that's the point. Smartphones: The Undoing Of Humanity? Limes and lemons are typically flavors found in carton drinks; for whatever reason, they're not popular fruits for solitary consumption (though I happen to like both limes and lemons). I was speaking the other day with someone who uses lemons, and only lemons, frequently as a cooking ingredient. I was surprised when she asserted that limes and lemons are the same fruit. Obviously, this is not true; she backtracked and asserted instead that limes are just "unripe lemons". While there are nutritional differences between limes and lemons I won't disclose here, the fact remains that saying limes turn into lemons is like saying windows turn into doors. Limes and lemons are completely separate fruits. A bit of research will turn that up. This cooking site, for example, briefs the reader about common misconceptions. The reader will learn that limes are not unripe siblings of the lemon. In fact, the lemons we buy at the store are also unripe. Both limes and lemons are unripe fruits. If you wish to know more about these beloved sour fruits, I advise you to do some more of your own research. Hopefully, you'll be spared the embarrassment of ever saying limes and lemons are the same fruit in public. As for me, I favor the lime a bit more than its yellower cousin. Limes don't have seeds and are a tad bit sweeter than lemons, making them the more delicious of the two to my taste buds! Many stores like Walmart and Sam's Club, especially the older ones, color-code their poles. Have you ever noticed colored pieces of tape at the top of some of these poles? Yes, they actually mean something! Blue — Blue tape at the top of the pole indicates that there is a telephone at the bottom of the pole. Yellow — Yellow indicates a spill clean-up station is located at the bottom of the pole. Red — Red indicates that a fire extinguisher is located at the bottom of the pole. Hopefully, you'll never need to look for this one. Some poles may have more than one piece of tape. For example, a pole may claim a blue piece of tape and a yellow piece of tape. That means both a telephone and a spill clean-up station are located at the bottom of the pole. From what I've seen, some poles may have just one piece of tape, while others may have two or even all three. Blue tape is less common than yellow or red tape, so if you need to make a prank telephone call, your choices are more limited. But if the guy next to you starts having a heart attack at the store, make sure you check the ceiling for some blue tape so you can call 911 (some yellow tape wouldn't hurt either). AM/FM Radio Numbering — What's The Deal? Millions of people regularly listen to terrestrial radio. AM (amplitude modulation) is an older standard than FM (frequency modulation) and is easier to implement. AM signals can travel between 100 and 300 miles while FM signals are limited by the curvature of the Earth, giving them a maximum distance of about 50 or 60 miles. While AM signals fade with distance, FM is consistent within the receiving area, making AM ideal for news broadcasting and FM ideal for music. All FM radio stations end in an odd number (88.3, 96.1, etc. ), though this is purely conventional and regulated by the FCC. AM frequencies are measured in kilohertz, while FM frequencies are measured in megahertz. AM stations range from 520 kHz to 1710 kHZ, with stations spaced 10 kHz apart, while FM stations range from 88 mHZ to 108 mHz. 1 megahertz is equal to 1,000 kilohertz, so technically AM stations range from FM 0.520 to FM 1.7 while FM stations range from AM 88000 to 108000. (Remember, all radio waves are part of the same electromagnetic spectrum — AM and FM are just different ranges of that spectrum.) In theory, tuning to AM 99100 is the same as tuning to FM 99.1. You've probably noticed you can pick up nearby channels on an unused frequency. For example, you can probably pick up the radio station FM 100.1 on FM 100.3 or AM 600 on AM 610. But do these numbers mean anything? Are some frequencies "better" than others? To transmit a signal, one simply broadcasts audio at a specific frequency. Lower frequencies require less power and travel farther, but are lower quality. Higher frequencies require more power and don't travel as far, but are higher quality. That is, the frequencies that will be transmitted farthest are at the lower end of the spectrum — the 520 kHZ and FM 88.1 frequencies will travel the farthest from the broadcast station and have the lowest quality. In theory, stations at lower frequencies transmit further and have the worst quality. For more information, see this article online. Are you looking for something nice and cool to do this summer? How about something really cool that's also cool? Dubbed the "Polar Bear Capital of the World", Churchill, Manitoba is a popular getaway among numerous people and it's one of the most popular tourism destinations in the world for viewing polar bears in their natural habitat. What makes Churchill so unique? First off, you can't reach Churchill by road at all. Nestled in northern Manitoba along the southwestern portion of the frigid Hudson Bay, there are no roads connecting this town of just under 1,000 to the rest of Canada. The only ways to reach Churchill are by air, train, or boat (Churchill has a port, but unless you're commanding a vessel through the bay ice, we recommend you don't sail there). Churchill is a great spot to watch the Northern Lights and it's also a great spot to come see the polar bears, the main driver for Churchill's tourism economy. You can go out on the ice in a great tundra buggy and truly immerse yourself in polar bear country. A remote town that is truly off-the-grid, Churchill is a must-see for anyone looking to connect with nature. well, let me know and we'll chat. This first video addresses the notion that desktop computers are stationary and stay in one place — all the time. Well, in this video, some students have decided to attend a lecture and they bring their desktops with them, computers, keyboards, monitors, dial-up modems, and all. In this second video, you'll witness what happens when the code to get on the Walmart intercom becomes public knowledge. Don't try this at home kids! Steve Jobs — Hero or Hater? Walmart CEO — Impostor or the Real Deal? Are there SMART-Boards in your school? Yes, you still need a landline! Welcome to the InterLinked Project's official blog. Come back often for new topics to ponder or to learn something new. You never know what you'll find here tomorrow!